Care & Repair Archives - Page 5 of 5 - Power Of Auto World! How To Remove Clear Coat From Headlights? The plastic on headlights takes a lot of wear and tear. This comes from rocks and grit hitting them while driving, and also comes from the UV rays in the sun beating down on it. This wear can cause clouding and yellowing. That is why a lot of people put a clear coat protective layer on their headlights to help them last longer. You should choose the best clear coat for headlights to get the best protection. The coating protects the plastic surfaces and helps the headlights to stay functioning at the top level. Sometimes though the clear coat gets old and starts to wear off. Generally, though it doesn’t wear off evenly, however, instead it chips off making it have an uneven look. After reading this article though you will be able to know what to do when this happens. You will be able to remove the old clear coat so you can restore your headlights and reapply new clear coat. To remove the old clear coat you really don’t need a lot of things. The main things you need are a few different grits of sandpaper, some water, a microfiber cloth, a cotton towel and some plastic lens cleaner and polishing liquid. The grits of sandpaper you will be using are 600, 1000, and 2000. The numbers mean how fine of sanding the paper does. The bigger the number the rougher the sandpaper, and the smaller the number the smoother or finer it is. If you have sandpaper on hand but don’t have these specific numbers, then it is okay to use what you have as long as the numbers are close to this. The key is to just start with a small number and move to a bigger one. The recommended numbers are just a suggestion and many people will tell you different things. The microfiber cloth doesn’t matter what brand and the polishing liquid can be whatever brand you prefer as well. It is a good idea to get plastic lens cleaner and polish that is made for headlights so it doesn’t damage the plastic. The last thing you will need is some tape to mask off the paint. You want to use painters tape or masking tape that will not stick to the paint and cause damage to it. Bonus: If you have a classic car, a classic motorcycle, a jet ski, a boat, an RV, an ATV or other vehicle with a 12 volt battery that you’re planning to store for the winter and you’re wondering how you’re going to keep it conditioned and ready to go in the Spring when you are ready to go again, purchase one of the best battery tenders is your solution. So now that you know what you need and have everything together it is time to start the removal process. The first step is to mask off around the headlights. You want to make sure to cover all the paint around the lights and also the chrome parts around it. You don’t want to accidentally sand the wrong area and cause more work for yourself. After you have everything taped off it is time to start sanding. To sand properly you want to make sure to keep the sandpaper and headlights wet, this is because the particles from sanding can scratch the headlights. This might sound odd since you are taking sandpaper to it, but you want to minimize the scratches from things other than the sandpaper. To start with the sanding you use the 600 grit one first. This will remove most of the clear coat that is still on the headlight. 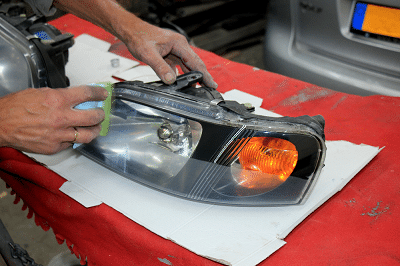 Be sure to hold the paper flat while sanding and go over all the headlight evenly. Next after passing over it good with the 600 grit sandpaper you want to move to the 1000 grit . You sand with it the same way keeping it flat and wet. The 1000 grit paper will remove the last of the clear coat and start smoothing out the surfaces for the later steps. Once you have passed over both headlights good with the 1000 grit it is time to move onto the 2000 grit. This will really smooth out the surfaces and will ensure a good finish when down. After passing over the headlight evenly with the last sandpaper the headlights will probably look cloudy and not clear. This is okay. It means you did it right. Now it is time to let the headlamps to dry completely. After the headlights have dried it is time to polish them up. To do this start with a cotton towel and apply some of your lens cleaner and polish to it. Go over the surface of the headlight evenly and smoothly in circular motions. You might have to do this multiple times to get all the loose plastic off the surface of the headlight and get most of the cloudy look off. Once you got the headlight almost perfectly clear it is time to move to the last step. The last step is taking the microfiber cloth and do the same thing as with the cotton towel. The microfiber cloth though will leave a very clear polished finish. It will make your headlights look like they are new. Once you have this done it is up to you what you do next. Most people decide to reapply a new clear coat to keep your headlights protected. After you took the time to remove the old clear coat and restore your lights to a new shine you don’t want them getting damaged again. You don’t have to put a new clear coat on them though, but it is a good idea too. So now you know all the things you need to remove clear coat from headlights and you see it is pretty simple. You just need some sandpapers, water, a lens cleaner and polish, and a couple towels. One tip for removing the old clear coat and restoring your lens is do one headlight at a time. This is so you get it all even. Also, take your time and mask off good so you don’t damage other parts of your car. With these tips and the steps in this guide, you should be able to restore your headlights to a perfect brightness with no trouble at all.